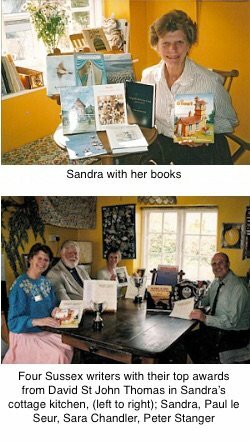 Sandra Saer founded the company in 1987 with publication of her own book: COLDWALTHAM: A Story of Three Hamlets. She was trained as a journalist, and worked as editor, and book publicist and marketer, on her own behalf and for the BBC. As a broadcaster of her own talks, when in Paris she transmitted, courtesy of Radiodiffusion Française, regular 'Paris Letters' to six radio stations around the world. Setting up and running SMH BOOKS was the culmination of all her professional experience. SMH now operates from an Arundel-based address (see our Home Page for other contact details) SMH’s list contains Sussex memoirs and other local and regional books, Christian-orientated titles, and anthologies of prose and poetry. We are delighted to have available again just a few copies of the lovely Sussex Memoir, AN EVER-ROLLING STREAM, Norman Wyatt's 'Rural Reflections of life in the slow lane' (FARNHAM HERALD; 'This charming book... is full of warm reminiscences, and characters' (CHURCH TIMES). AN EXALTATION OF SKYLARKS (2,300 years of Skylark prose and poetry compiled by Stewart Beer, with a Preface by Richard Mabey), is a TRIPLE-AWARD-WINNER! Sandra's children's book, THE GIANT AND THE MOUSE, written for her own four, when aged 4-8, has been read to primary-school children in many parts of the country. It received a PRESTIGIOUS AWARD FOR SELF-MARKETING from the David St John Thomas Charitable Trust..
Two titles (meant to be the last! ), published on 27 October 2006, were EACH DAY’S A DIAMOND (now out of print): Facets of Life through Poetry - a lovely miscellany by Robert Melliard, and MORE FROM PEAR TREE COTTAGE, Sandra’s second book of prose and poetry, the writing of which,she says, owes much to her cottage, in whose tranquillity her work was mainly done, over twenty- eight years. Both these books are now out of print.